Today is my 1 year wedding anniversary. We had an amazing wedding at the Hudson Hotel in Manhattan last year, it was the most perfect day (even with rain). So, a short post before we head off to a B&B in Pennsylvania to celebrate the day. This was the design for our wedding stationery, and I still love it. 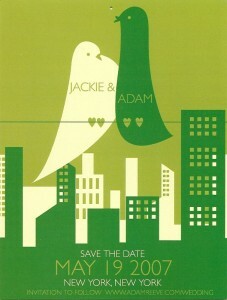 This is a Save the Date card. The printed colors of the invites were a little darker, but you get the idea. This was a custom design by Eleanor Grosch at pushmepullyou design. She is awesome, and this design was one of the first things we did while planning. It set the tone for everything else, including the color scheme. Eleanor designed some very cool shoes for Keds, which is how I found her. She also does great prints of her quirky designs; we have several hanging around the house. I’m a huge fan.